For thousands of years the rolling grasslands and dependable rivers made the open plains of the area we now know as Ladysmith the ideal environment for its first inhabitants, the san people (Bushmen). They were hunter gatherers, living off the land and hunting freely on the quiet flood plains. From the coast of KwaZulu-Natal, the rising Zulu Nation spread its wings slowly towards the Drakensberg Mountains, claiming land and driving away other tribes in their path. After a visit by the great King Shaka, he promptly named the area “Emnambithi”. In Zulu the word for something tasty is “namibitheka” and this is how he described the sweet water of the Klip River. In 1836 the first Voortrekkers crossed the Drakensberg Mountains and feasted their eyes on the green grasslands of KwaZulu-Natal. After negotiations, Dingane’s successor; Mpande, permitted members of the famous “Wen” (Winning) Commando to settle in the area for a brief while the area was referred to as the Klip River Republic. On 31st May 1844 the British annexed Natal as a district of the Cape Colony, resulting in the early death of the new republic. Many of the Trekkers, refusing to accept British rule, left Natal and headed for the Boer republics of the Transvaal and the Orange Free State. The Governor of the Cape Colony, Sir Harry Smith, visited Natal in 1846 and was particularly interested in the area around the Klip River. A surveyor Mr John Bird, was appointed to find a suitable location to establish a town. Bird began early in 1848 and on Mr van Tonder’s farm found a tenable spot in a loop of the river between high banks. In 1849 the town was described as “a well adapted village” consisting of only four houses and known locally as Windsor. On 20th June 1850, Lt Governor Benjamin Pine proclaimed it a township and three months later, in October, the town was officially named Ladysmith, after Juana Maria de los Delores de Leon, the beautiful Spanish wife of Sir Harry Smith. By 1851 Mr George Winder had opened a shop and several new buildings were erected. British settlers moved into the district and soon Ladysmith was thriving. 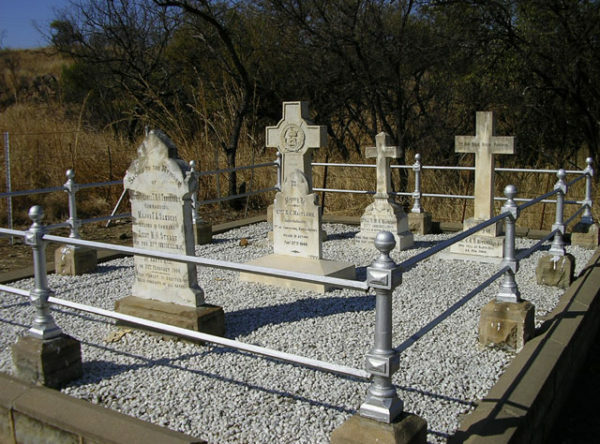 Within a few years the town had developed into an important stop over for transport wagons and travellers going to and from the Republics of the Orange Free State and the Transvaal. With the outbreak of the Anglo Zulu War in 1879, residents hastily strengthened the fort in fear of being attacked, this however never materialised. The local Board was established on 5th May 1882. The first Chairman was Mr G. King. On 9th June 1882 the town received Borough status and the first Town Clerk was Mr G.W. Lines. In 1886 diamonds were discovered in Kimberley and gold in Barberton and the Witwatersrand. Traffic through Ladysmith increased tremendously with between two and three thousand wagons passing through Ladysmith some months. Trade from this passing traffic greatly boosted local businesses. With the establishment of the railway lines first to the Transvaal and later to the Orange Free State, Ladysmith was firmly established as the main stop over and trading centre for the surrounding district. The impressive Town Hall was built in 1893. Ladysmith prospered and grew. The first Mayor was elected in 1899 – Mr Joseph Farquhar. On the 11th October 1899 the Anglo Boer/South African War broke out between the Boer Republics and Britain. Ladysmith was catapulted into world fame when the Boer Forces laid siege to the town on 2nd November 1899. For the next 118 days Ladysmith made headlines worldwide until its relief on 28th February 1900. Despite the devastation caused by the constant bombardment, the town endured. Many farmers had to start all over again and the perennial floods and drought made matters difficult. With the outbreak of the World Wars in 1914 and 1938 many able bodied men were sent away to fight. After the World Wars, the town enjoyed a period of peace and tranquillity. The worst ever snow storm was recorded in 1924 with the main street covered in half a metre of snow. By the late 1920’s the town was providing mostly for the needs of the farming community. During the Great Depression of the 1930’s many people flocked to the town to make a living. Once again the railways proved to be a sturdy crutch to help the town get back on its feet. The large railway staff added to the prosperity of the town by providing a constant spending power. The 1940’s and 1950’s saw unprecedented growth and expansion. The effects of the Apartheid government through its group areas act in the 1960’s hit the town hard as the Indian businessmen were forced out of the central business area. Shops remained empty for years to come. Since the early 1980’s the town has boomed with industrial investment. The first Democratic Local Government came into place during 1994, combining Ladysmith with its two townships of Steadville and Ezakheni. In 1996 the Qedusizi Dam was completed, effectively ending the Klip River’s reign of terror and regular flooding. During 1999 new municipal demarcations saw the villages of Colenso and van Reenen being added into the Ladysmith fold. 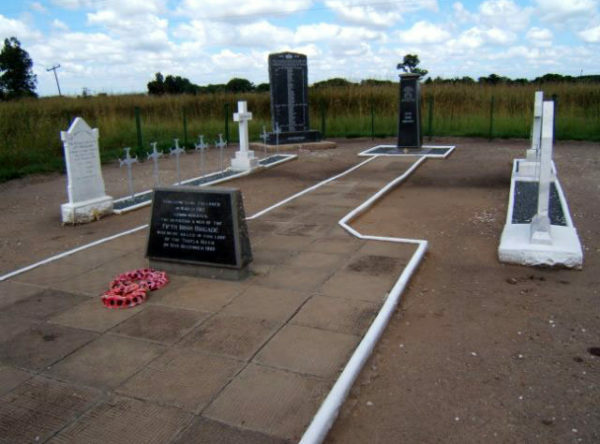 Erected in memory of the men of the Battalion who died during the Siege of Ladysmith.